Day VI: Slept in this morning – we were at a tavern down the road last night until nearly 1am, so we felt content to lounge around a bit. Decided to have a relaxing day. This started with a distinctly not-relaxing trip through Gythio to find an ATM. Driving in Greece is challenging at the best of times (extra-small roads with no shoulders combined with drivers who think they’re trying out for stunt-man teams), but driving in a city at lunchtime is especially trying. I’d recommend stoplights, but in a country without screens in the windows, I don’t have any hope that anyone would take my recommendations. Our eventual destination was the Hotel Belle Helene in Vathi, where we thought we might able to reach the dual Meccas of beach and wifi in one place. Unfortunately, their wifi has been broken “for 50 days,” but I was so taken with the notion of renting a beach chair and umbrella that we stayed for several hours. The beach was made up of small rocks instead of sand, a feature that I appreciated. 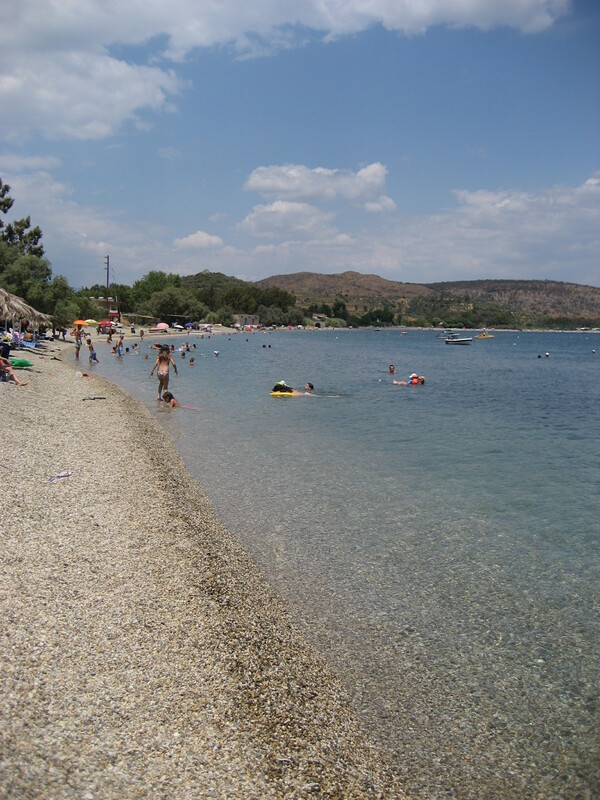 The water was nowhere near as clean and beautiful as that at Skoutari, but the water and views were both ideal. The hunt for wifi (a daily game) led us to seek other quarters. 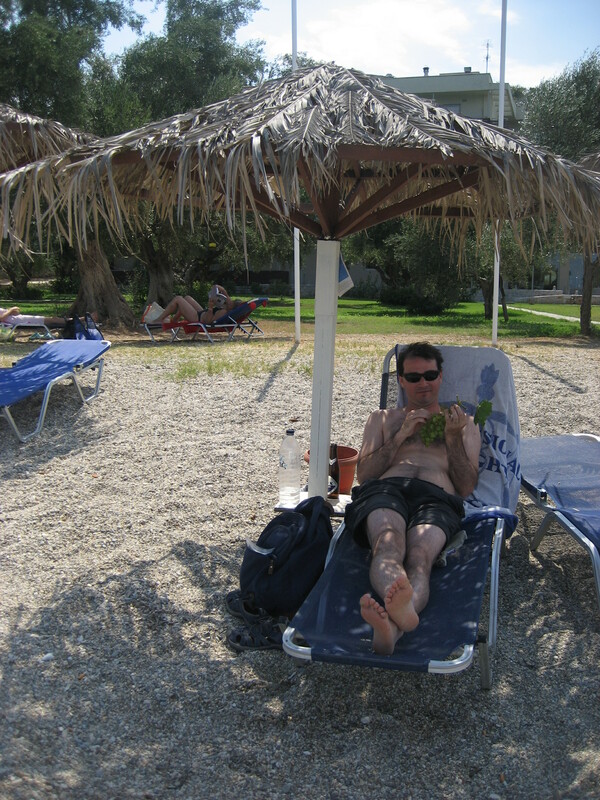 We moved on to Mavrovouni beach, where we sat at a table on the sand and had lunch. Lunch was excellent: grilled feta and a surprisingly good shrimp in a red sauce with pasta. It looked like something you might get at a bad Italian restaurant in the US, but the shrimp had their heads on and it actually tasted good. I went for a swim after lunch — the waves are choppy and the sky showed signs of a storm that might roll in, butwaves and the wind were up, but the water was perfect. The evening’s adventure was a trip up into the mountains, first along a dirt road in the scrubby forest, and then up through tiny mountain villages. Our first stop was Arna, where we were told we were going to see a big tree. 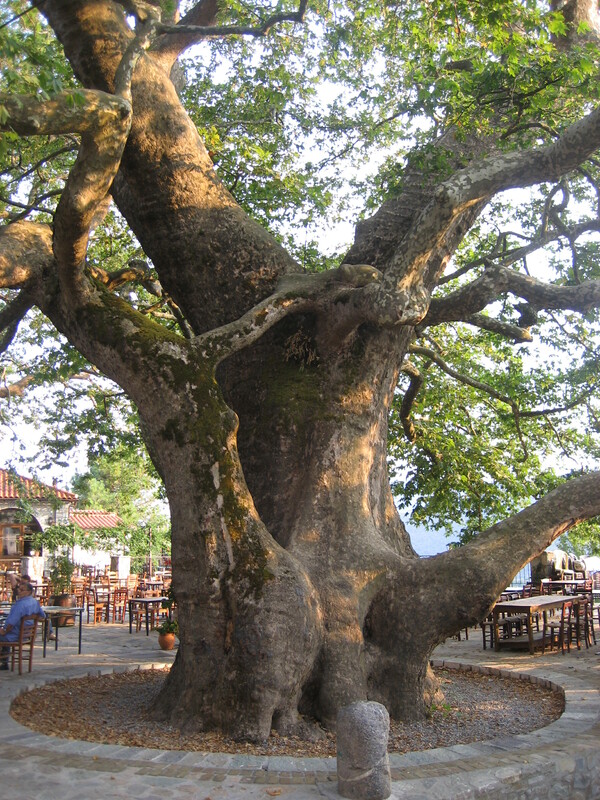 I must say that we were both a bit skeptical about the idea of making a special trip just to see a tree, but this turns out to be a pretty special tree: ancient, giant, and right in the middle of the town square. The view beyond it looks down a steep hillside into deep mountain valleys. It’s a maple tree (it took us longer than you might expect to have this confirmed). 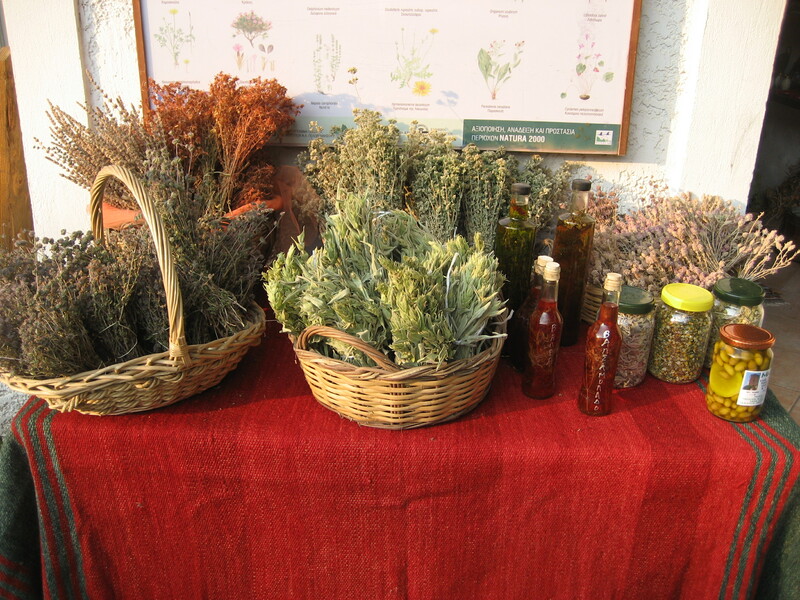 We walked around the square, admired the tree, stopped at an herb shop to buy herbs and jam and olive oil soap (George, appalled at the prices, helped us haggle them down). Our next stop was Rahidi, which is a restaurant on the top of a hill with 360 views down to the sea and back to the mountains and the sunset. It was the kind of place you could sit for hours. We just had drinks there (I had sour cherry juice, which is yummy; Prescott had a Greek coffee, which feels like sand in your mouth and was pronounced undrinkable). 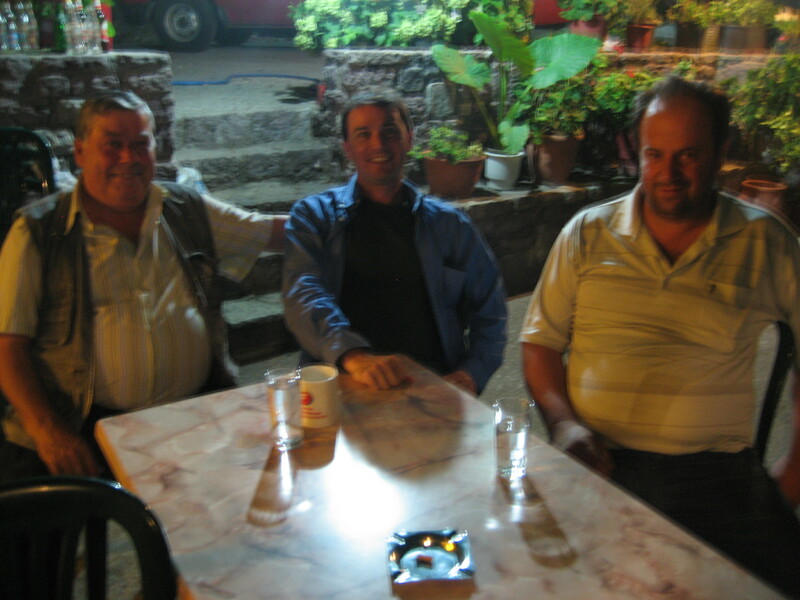 The final evening jaunt was to the village of Vasiliki, where we’d been told to have dinner made by a woman named Vivi. The tavern was right on the village square, and it’s the only local hangout. We arrived to find a group of men playing pinochle and kibitzing, which was fun for me to see (it’s as if the Bridge Ladies moved outdoors). A gentleman sat down at the table next to us who spoke good English, so we started chatting. 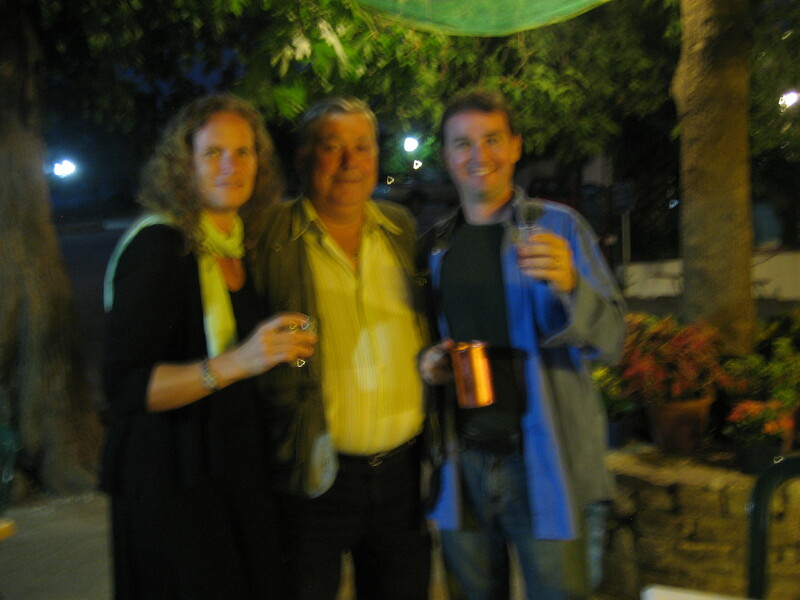 We eventually learned that he’s a friend of our Greek host, Dimitri. (Dimitri, if you’re reading this, George Patsacos and Angelo Vaggelis say hi! And everyone here calls you Jimmy.) We stayed at the taverna quite late, talking police issues, the law, and politics, until it grew time for the long, windy road back down the mountain.